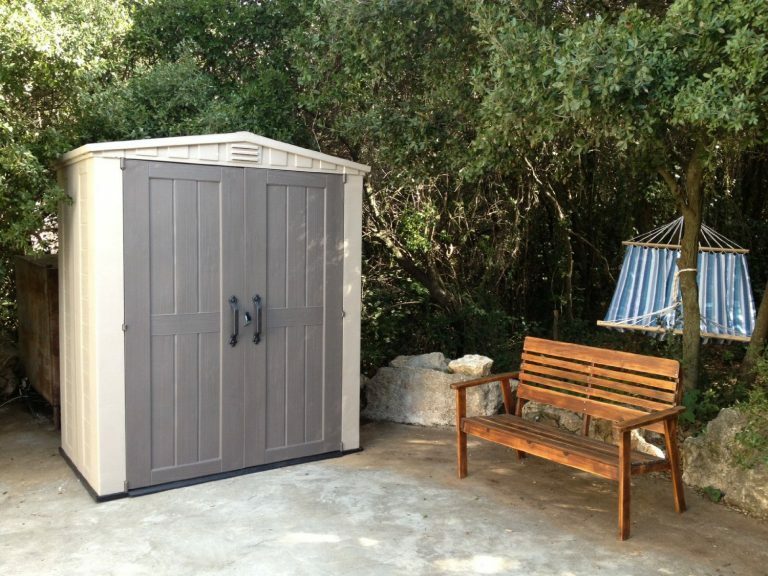 The Keter Factor 6×3 beige Shed adds a stylish addition to any patio or backyard. 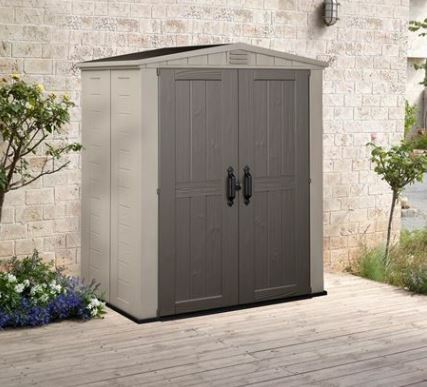 Built to store a fair amount of gardening equipment yet small enough to stand in the corner of a patio to fulfil its modish appearance. 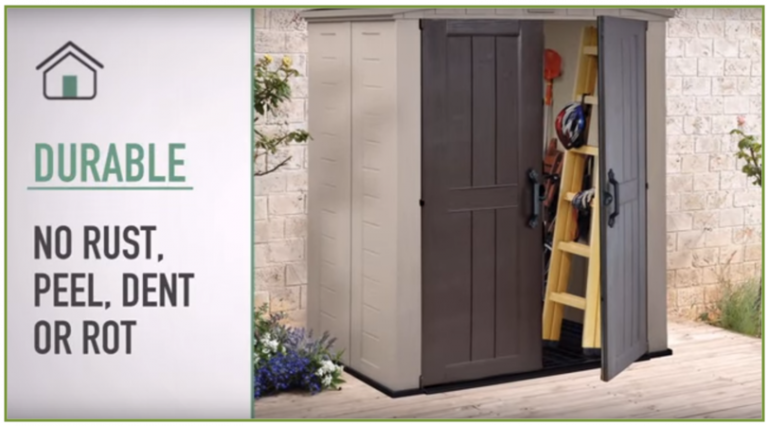 If you are looking for modern, easy to clean patio storage ideas for outside your home this quality storage solution is worth consideration. We decided to change from the wooden variety and purchased a quality plastic shed. It’s been a great decision on our behalf, now gotten rid of ongoing maintenance duties wooden sheds provide. A quick wash down is all that’s required to bring ours back to pristine condition. Factor sheds are very competitively priced. 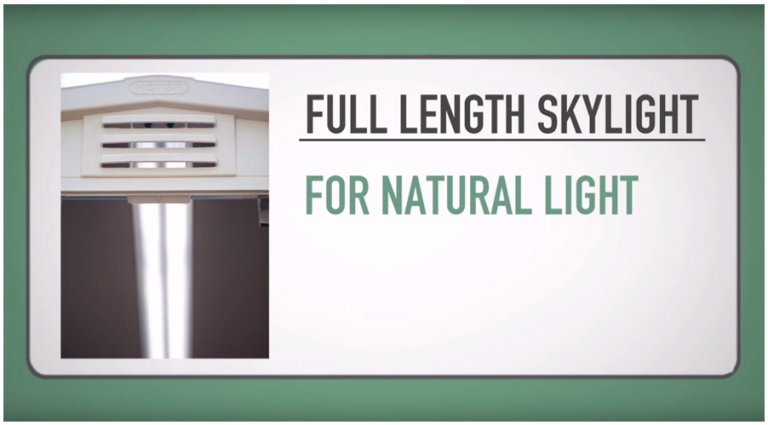 They’re a sturdy construction wrapped in weather-resistant resin providing low maintenance. OK, perhaps there are some more attractive models out there however compare prices, it becomes apparent why this range is a Global Best Seller. Designed with a beige coloured facade that merges stylishly with the shade of the light grey doors certainly adds a modish twist for any patio. 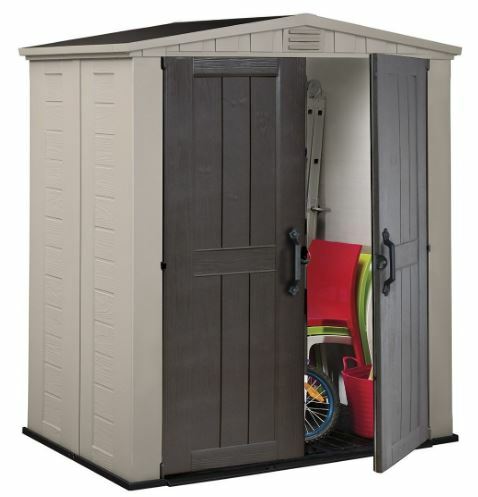 Small enough to fit in tight spaces makes this shed an ideal size for the the smallest of gardens or backyards. 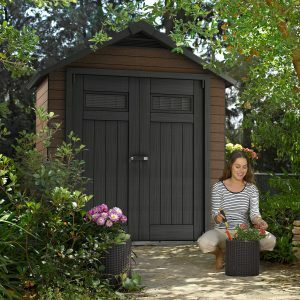 This shed caters for maximum storage into a minimum capacity of space making it ideal for patio and gardening accessories.. 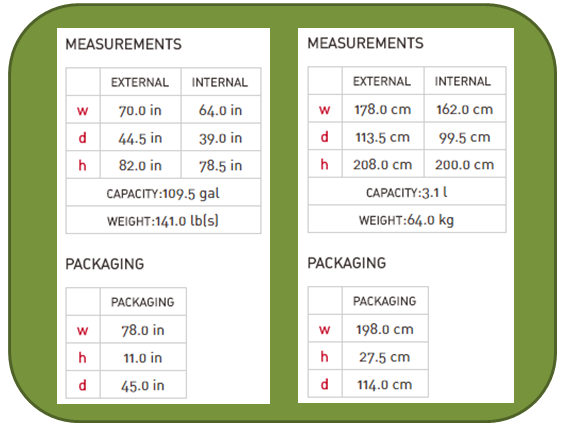 Check the internal size measurements below to see if it meets your requirements. 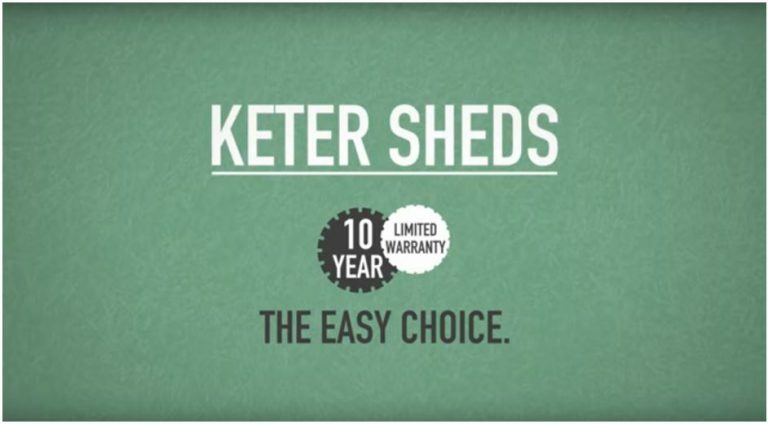 Shed Ranges: Scroll down to Keter Factor to view the entire range. 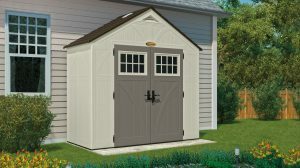 Select the image for a full review for each shed. The features that rock my boat are the sturdy construction, an apex designed roof to ensure rainwater runs straight off and the attractive modern stance Factor 6 x 3’s behold. An integral skylight allows daylight to enter inside whilst air vents preserve storage due to the fresh atmosphere created. A built-in floor keeps storage clean yet manufactured with strength to store those heavy items. 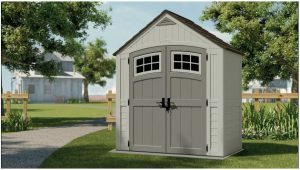 The beauty of this shed is the wide double door access. Once opened you have access to the entire shed within arms reach as it’s only 3 ft deep. Accessing your equipment won’t be a problem here. The height is another advantage too, alongside storing the usual garden equipment and power tools like hedge trimmers, you can store long handled garden tools and ladders yet the store is deep enough to harbour patio necessities and barbecue equipment. I love reading reviews from people who have purchased as these portray any problems regarding assembly, quality and overall value for money. It’s basically their true evaluation for the shed’s features and how life is like living with their shed. Good quality whilst competitively priced is the huge draw where Factor sheds are concerned. Overall the reviews and price compared with quality are excellent. Keter have updated their models so make sure you are reading a recent review as all these reviews come across with one heck of an easier assembly than it’s predecessor. 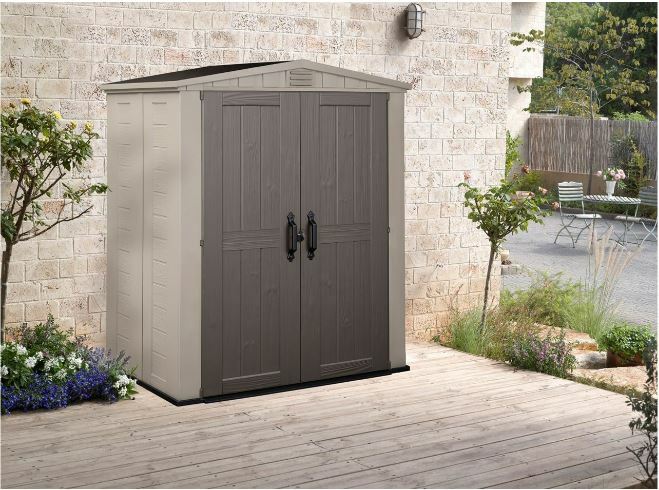 Purchasers are particularly fond of the peaked apex style roof Factor sheds deliver ensuring quick drainage whilst the built-in floor receives rave reviews keeping storage clean, we find this too, cleaner than in the garage I might add. Air vents receive huge thumbs up as they keep the interior fresh rather than acquiring that sweaty atmosphere. Another huge advantage where Factor sheds receive full appraisal are their easy assembly, only requiring 2 people using household tools. Only minimum DIY skills enable this shed to be assembled. All the Factor models are extremely popular in the UK and USA. Described as a Global best seller. 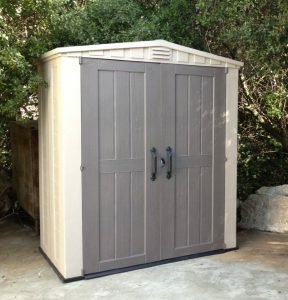 Construction – How sturdy is this shed? Our first concerns choosing a plastic shed was finding something that’s going to stand up to the weather providing protection for storage. We looked for a quality resin skin wrapped around a steel frame to provide a peace of mind sturdy structure. The entire Factor range are constructed out of resin sheets, including the floor, walls and roof to provide a sealed unit for protection against the ever changing weather conditions whilst bolstered together and reinforced around a steel framework. 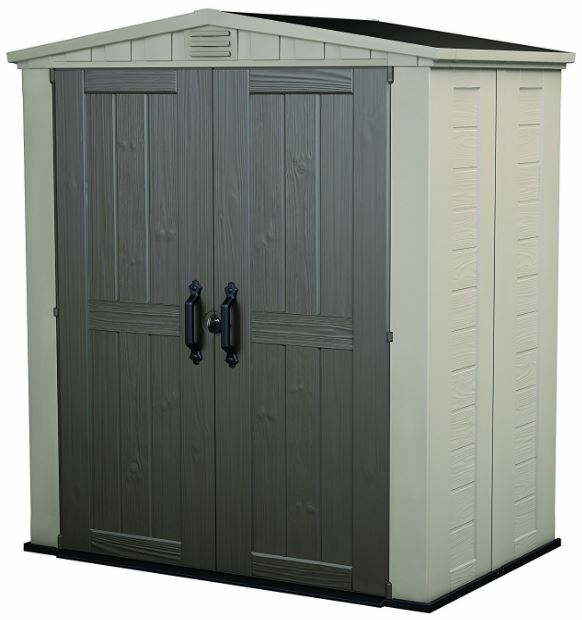 The resin sheets simply join together by slots and screws securing to the supported steel reinforced structure providing a sturdy finish, couple this with the durability factor you are presented with an excellent quality shed that’s competitively priced. The walls are molded to display an attractive wooden grained effect texture running through, complementing its stylish looks. The facade’s makeup is Polypropylene resin manufactured into an attractive clean looking beige appearance molded to resemble elegant wood panel stylin’ that’s waterproof, durable and the beauty is, they’re easy to clean. The weather-resistant manufacture stands up to the rain and snowy weather conditions keeping storage dry and safe. The polypropylene resin is 100% recyclable, an added benefit towards our environment whilst technically advanced to withstand cracking and fading in the sun. Many reviews confirm this, me too. So we have a quality plastic shed that’s weather resistant, environmentally friendly, durable and resilient. All thanks to this marvellous resin. Not bad – hey? We’re delighted with our hassle free outdoor living. No more time wasted on maintenance jobs thanks to this resin facade. We generally hose the shed down when it gets grimy to keep it looking clean. Can the roof stand up to the weather elements? The roof is apex in design, sealed to the walls yet overhangs the sides of the shed to prevent water entering inside. The peaked angle is well designed for rainwater to run straight off. The roof, like the walls is made from weather-resistant resin that’s durable and built to last. The roofs construction comes in sheet form that’s secured to the reinforced framework providing a robust sealed roof when assembled. No more refelting roofs here. We’re particularly fond of the apex construction. Water runs straight off leaving no possibility of water puddling and entering into the shed at the top of the walls as the roof sheets protrude beyond, the beauty of an apex design. 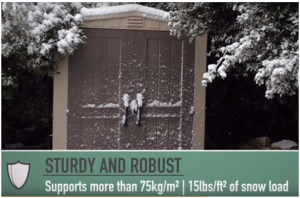 To give an idea of the strength of the roof, it will support more than 75 kg/m of snow fall. How durable is the built-in floor? Like the walls and roof, the floor is a polypropylene resin manufacture that comes in sheet form built into the shed providing a sealed unit to the walls. This is one of our main attractions towards plastic sheds of this quality. No rainfall or pests can enter inside these sheds where the floor meets the walls. Factor shed floors are truly built-in protecting storage from getting dirty and covered in mud, the reason we turned our attention away from the metal variety as they seldom have floors built-in. The floor is manufactured into a thick based resin purposely designed to withstand heavy items laid on it, supremely durable especially for a storage unit this size. The built-in floor is a real positive feature on our behalf, storage is kept clean and due to our foundations being solid and level the floor serves as heavy duty, just as described. Embedded with the floor are anchor points to enable securing the shed down into the base. We anchored our shed down which is advisable, making it worry free. 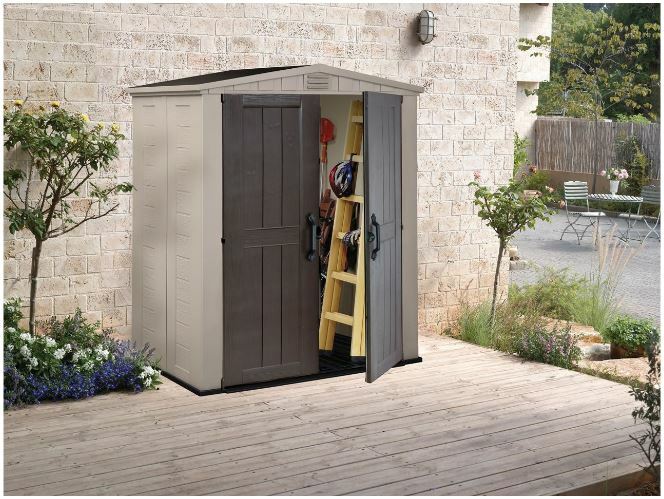 Factor 6 x 3’s provide a generous internal 2 metre height allowing the storage of tall items and long handled gardening tools yet the beauty here is once the doors are opened across the 6 ft width, access to the entire storage collection is within arms grasp as it’s only 3 ft deep. You are presented with ventilation towards the peak of the apex built into the walls just above the doors that allow ample airflow to circulate around inside. This is important, sweating was a big concern in the early days of resin sheds, these new designs have overcome this issue. We’re impressed with the fresh atmosphere our shed delivers inside, storage is kept dry and aired due to these additions and this does preserve storage, a fresh environment rather than a sweaty atmosphere certainly receives the thumbs up through feedback. Built into the ceiling is a skylight allowing natural light to flood in. This is mainly for the larger sheds to provide light when the doors close for safety purposes. Not that it affects a shed this size as you’re not going to be walking into it. Great safety feature nevertheless. You are also presented with shelving brackets for fitting your own shelves. We and many other plastic shed owners opt for Stand-Alone shelving for this purpose as they hold a lot more weight than anything screwed and supported into plastic. OK for light items though. I’m particularly fond of a double door access, this creates a hassle free service when entering in and out with storage. This 6 x 3 model’s doors open the entire width of the shed providing wonderful access. The doors, like the walls are manufactured from Keter’s benchmark, polypropylene resin molded into a stylish wood panelling effect whilst providing the same waterproof, weather-defence and durable credentials the walls possess, imperative for storage protection. 2 clasps are fit on both doors, when closed they join together enabling locking the shed through their padlock design. A padlock is not included for the lockable doors, this has to be purchased separately. The main attraction for me and so many others is the low maintenance issues a plastic shed has compared to its wooden counterparts, the reason I’m so passionate about them. No rusting, peeling or rotting issues to deal with. no re-staining or re-painting jobs and no re-felting a rotten roof wooden sheds are prone to either. This feature has made our summers hassle free, a light hose down certainly beats our last maintenance issues. All that’s required is a quick wash down, many use a pressure hose. When ingrained dirt becomes a problem we use a dash of washing up liquid with 2 cups of white vinegar mixed into a bucket of warm water and rub the stubborn marks off with a cloth. This always does the trick to bring back its pristine appearance. Never use anything too abrasive however as this may scratch the surface of the resin panels. We use a soft brush or cloth and this works fine. We complied with the resin sheds foundations rules and prepared a solid level base. This can be wood or concrete. 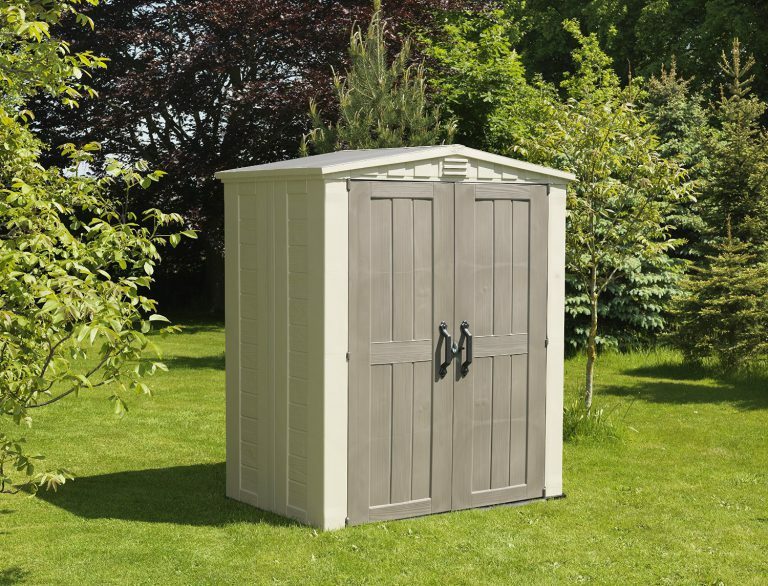 A level base ensures the shed stands to perfection, it makes assembly easy simply because all the panels line up without hassle plus we found the floor serves as described, heavy duty. A great tip from us and many others is to get all the parts out and in-order before assembly. The build goes a lot smoother if you are organised. Tracy and I didn’t come across any problems assembling due to her organisational skills. We think this is purely down to having the correct foundations. You start with the floor, place in the walls and steel structure, followed by the roof and doors. Every section requires you to screw the separate parts together. There’s no sawing or special tools required for this job, a screwdriver will build it. I found a power screwdriver set on a low torque setting preventing jiggering up the screws a huge advantage. Makes the job a smooth and quick construction. It’s always advisable to anchor the shed down into the base for protection against high winds, this is what we did. The reason I’m not too fond of these plastic bases you fill with pebbles is because you are unable to anchor the shed down. Many disagree due to the fact the shed is full and too heavy for wind to move it, not me. What’s the Factor 6×3 competition like? Competition is becoming mighty strong these days due to many relishing the prospect of a maintenance free future. 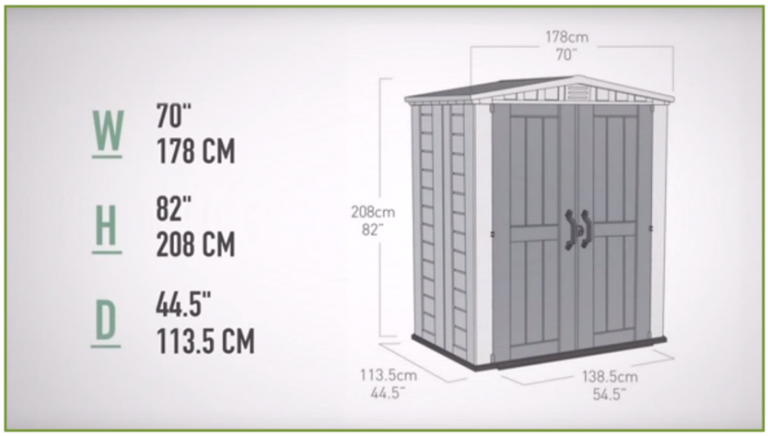 Check Shed Sizes here: Scroll down to your preferred sized shed and select the shed image to read the full review. 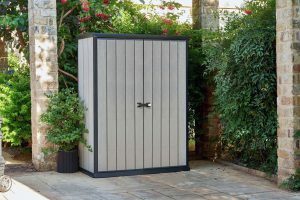 No shed is perfect and there will always be the odd bad review for any but on the whole the Keter Factor 6×3 Shed is mighty fine, will look attractive on any patio and serve as a wonderful storage solution for your outdoor gear. Reviews certainly provide the vote. It’s small size yet adequate interior provides a whole host of storage solutions making it ideal for standing where space is tight whilst charming looks provide the attraction. The huge draw is the low maintenance benefits, only requiring a wash down every now and again to keep it looking slick. Couple this with the competitive price, there’s no wonder it’s a global best seller. If you have any questions I will be happy to find the answers for you. Drop them in the comments section below. I think this is a great thing for when an elderly parent moves in and you need to store all of their furniture somewhere. I like the fact that it is designed to keep the water out, this means that the couches and wood tables and chairs will be safe and dry. Yeah, they’re waterproof and durable to the ever changing weather conditions and a very popular storage facility for patio accessories and gardening tools etc. And with the added benefit of being very competitively priced. But for tables and couches, they simply will not fit in. 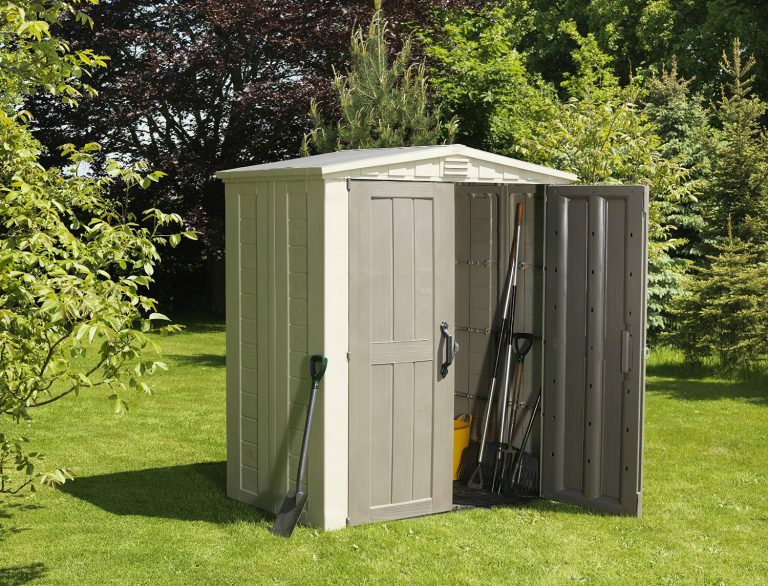 You will have to take a note of the measurements for what this size shed will store regarding your circumstances. This page shows the whole range all the way up to 8ft x 11ft. 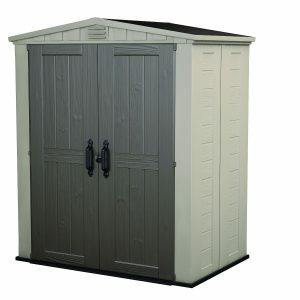 If you see something you like the look of at a suitable size I have prepared a full review for each shed in the range. You know I have never heard of a plastic shed. Would not have thought they would be strong enough. But I suppose it is years of conditioning. Plastic is used in everything these days, so why not sheds. I image assembly would be easy with plastic, not drilling into tough metal. I suppose they are UV safe, how long do they last? Plastic / resin sheds are becoming ever so popular these days due to the maintenance issues their wooden counterparts are prone to. You simply wash them down when they become grimy rather than re-staining year on year. Plastic is used in pretty much everything these days, you are right and with how technical advances have evolved a strong, durable and weather-resistant product has been formed. Assembly is very straightforward as you can put them together with household tools but they must be laid on solid level foundations so all the panels line up correctly plus the added benefit of the floor will serve as hard wearing. They are UV safe, produced to withstand fading and cracking in the sun. Lifetime can only be described as a long life. 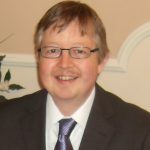 Plastic / resins longevity is on-going.